Amazon Prime offer: Now you can avail Amazon Prime benefits at Just 129 Rs/month or 999 Rs/year. The monthly plan is must have if you are planning to buy something during Amazon Prime day sale as Amazon will offer many exciting offers only for Amazon Prime customers. Select plan and complete Payment. That’s it, you will get Subscription validity as per your plan. (2-4/4-7/7-10 business days) Free Orders with items that are Fulfilled by Amazon worth Rs. 499 or more will qualify for free delivery. A delivery charge of Rs.40 will be applied otherwise. As a limited period offer,no delivery charge will be levied for orders containing items from Books category that are Fulfilled by Amazon. Now you will see “Start your 30-day free trial“. You will get a free Prime subscription for 30 days. You may not see free trial option if you have used Amazon prime trial earlier. So Please follow given steps carefully. 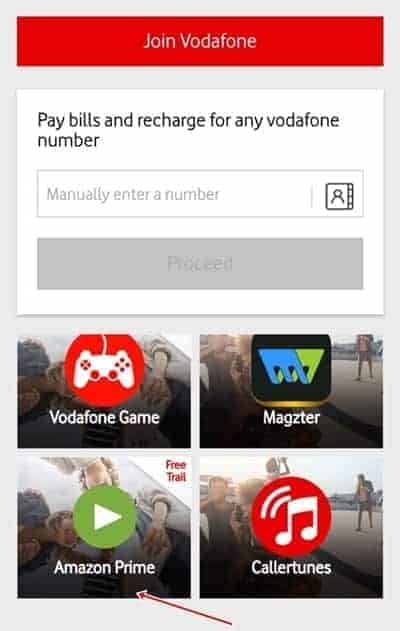 Install and Open the MyVodafone App. Install it and Login your Old Amazon account. Now Click on 1st Banner and choose action via Chrome browser. Pay the Amazon Prime membership fee of Rs 999. You will get the Rs 250 Amazon Pay Balance within 30 Days. Each customer is eligible to receive benefits only once, irrespective of the number of times he signs-in & watches Amazon Prime Video. The offer is also applicable once per device. This Amazon Prime Offer applicable on Android OS devices only. This Offer can be availed by all post-paid and prepaid subscribers (subject to eligibility) of Vodafone India. This AMazon prime Offer is valid for a period commencing from 18th February, 2017 to 31st December, 2017(“Offer Period”), unless revoked or extended by Amazon in its sole discretion without any prior notice. In the event any Purchaser fails to meet any of the above-stated eligibility criteria or any term under these Offer Terms, he/she will not be eligible to receive the Gift Card under this Offer. The Purchaser will be able to purchase the Amazon Prime subscription after 30 days free trial. In case the Purchaser has already availed the free trial, he/ she will be eligible to make the immediate purchase of the Amazon Prime subscription. Information with respect to the Gift Card will be sent to the registered email ID of the eligible Purchaser by Amazon within 30 days of the date of purchase by a Purchaser. Must add balance on the same day after joining Amazon Prime. This Amazon Prime Cashback offer is valid from 08 December 2017 to 31 December 2017. Join a one-year Prime membership between 8th Dec to 31st December and load Rs 500 or more to your Amazon Pay balance on the same day to get 20% cashback (up to Rs 300) as Amazon Pay balance (“Offer”) in the Offer Period. The Offer is applicable only for customers who start a One-year Prime membership in the offer duration (8th Dec to 31st December 2017). If you joined one-year Prime membership before 08th October 2017, then you are not eligible for the offer. The cashback is limited to a maximum amount of Rs 300 per customer. Eligible customers will receive the cashback amount in the form of Amazon Pay balance in the Gifts & Credits section, which will be credited to their account on www.amazon.in on or before 21st Jan 2018. The Customer is an existing paid Prime member, i.e. s/he started a One-year Prime membership before 08th December 2017. The customer does not fulfil both criteria i.e. 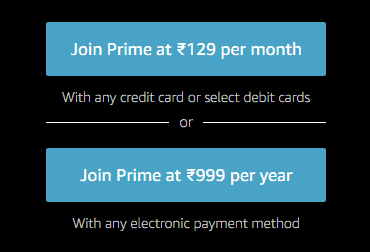 joining paid Amazon Prime one-year membership and loading Amazon Pay balance for Rs 500 or more. If Customer cancels Prime membership on or before 21st Jan 2018.